The only disappointing thing about this book is that I will have to wait almost an entire year for the second book in the series. 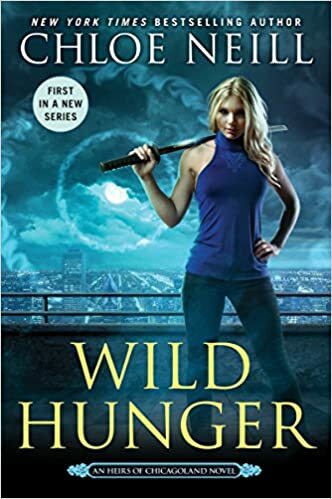 The author did a great job of shifting the main characters from Chicagoland Vampires to supporting characters and making their children the main characters. The ones you grew to love are now parents and their children have traits similar, and are different enough with new stories and challenges to face. This book was so hard to put down I read it in one day. Elisa Sullivan, is the only vampire to ever be born, and her best friends have powerful parents as well. Connor Keene is the son of the Apex of the pack and knows he will one day lead the pack. Lulu Bell is the daughter of two powerful witches and denounces magic, so that she will not fall into the problems her mother once faced. While Connor and Elisa had been around each other for almost their entire lives it is Elisa going to school in Paris and returning home that they see how much they have changed from the little children who annoyed each other. When an innocent pack member is accused of murdering a vampire at Cadogen House, Elisa, Lulu, Theo, and Connor team up to figure out how to save Riley. Too many awesome characters, a budding romance, and supernaturals means this series will be my favorite. Dare I say this might be better than Vampire Chronicles (Anne Rice), Chicagoland Vampires, and Vampire Academy? Only time will tell, but this book makes the series seem very promising. Elisa Sullivan = daughter of Merit and Ethan Sullivan, only vampire born not made. Grew up in Cadogan House, tutored at nighttime, went to college in Paris and promised a year of service to the house that let her stay there, even though she is not a member of that house. Does not like violence for the sake of violence and does not like innocent people (or supernaturals) being hurt for no reason. Grew up with Connor and Lulu, and upon returning home for a visit realizes that people change as they grow, however that does not mean connections to people dissolve. Connor Keene = son of Gabriel and Tanya Keene, werewolf/shifter, good looking and he knows it. Takes joy in annoying Elisa, and calling her brat. Always dates a gorgeous hard partying woman. Responsibility for the pack is his concern, but also realizes he cares about Elisa and finds a way to protect her while keeping his duty to the pack. The epilogue foreshadows possible future novels and potential complications for Connor and Elisa loving each other. Lulu Bell = daughter of Mallory and Catcher Bell, is a witch, but does not use it. Takes in Elisa when she doesn’t want to stay at Cadogan House, agrees to be Elisa’s normal. Stopped dating Riley, because it was too hard to stay away from magic. Is an artist and painting a mural for the pack. Ethan Sullivan = Master vampire of Cadogan House, Elisa’s father. Hurt by her decision of how she goes about trying to clear Riley of murder. Supports Elisa and worries about her. Madly in love with his wife. Merit “Duchess” Sullivan = Sentinel of Cadogan House, Elisa’s mother. Understands Elisa’s decision to move in with Lulu and feels it is full circle for how Lulu’s mother housed her when Merit left her parents. Supports Elisa’s decisions and encourages her like only a mother could. Madly in love with her husband. Gabriel Keene = Connor’s father, North American Central Pack Apex. Helping groom his son to be Apex one day, but recognizes that there will be challenges and others who want to be Apex. Planning a trip to Alaska that Connor will lead to help restore the pack’s power and deal with a few enemies the pack has. In the epilogue Gabriel warns Connor that him loving Elisa will be a hard road and to watch her back because of a prophecy. Connor knows it is hard and doing the right thing might be hard but the road is the road and he loves her and he knows he has to do the right thing for the pack. Seraphine = “Seri” vampire, made by Bourdillon a very old and powerful vampire, part of the French delegation that goes to Chicago for European peace talks. Marion = Master of Maison Dumas, the house that let Elisa stay there while she attended college. William Dearborn = Chicago’s Supernatural Ombudsman, Elisa and others think he is all flash and no substance. He does not appear to care about the right thing being done as much as he cares about how he comes across to the press and the mayor. Theo Martin = Assistant Ombudsman, former CPD, human, fascinated by vampires but not thinking about joining a house. Assists Elisa on several of her adventures in trying to clear Riley’s name and understand what the fairies are up to. Roger Yuen = Second in Command at the OMB, many think he should be in Dearborn’s place. Yuen cares more about doing what is right and helping maintain a good relationship with all supernaturals. Petra = OMB tech lead, aeromancy (lightning), had been tutored with Elisa when they were younger, but moved to Wisconsin and they lost touch. Riley Sixkiller = member of the pack, Lulu’s ex, accused of killing Tomas. Does not have a perfect background, but has changed. Him being nice and saving Elisa from political conversations at a few parties upsets Connor. Elisa knows he did not kill anyone and tries to help clear his name. Connor knows he did not kill anyone and want to free him so the two of them can ride to Alaska together as planned. Claudia = leader of the fairies, is told the peace talks for the European vampires is really a revolution for them to take power from the fairies. Disappears under suspicious circumstances. Tomas Cordona = Master of Casa Cordona, conservative, does not believe supernaturals should mix, murdered during a party celebrating peace talks. Miranda = gunner for Gabriel’s spot, mountain lion, opposes species mixing. Does not like Elisa visiting and talking to Connor. Tries to insult Elisa and Elisa stands up to her and tells her being called brat does not hurt her. Malik Washington = Elisa’s uncle, got his own house 2 years ago. Tabby = Connor’s date to the peace talk events, a panther, flirts with Dearborn in front of Connor. Emma Garza = Tanya’s sister and attorney the pack uses. Clearance Pettiway = guard for the OMB since Elisa started visiting as a child, and always reading a book. Eli Keene = Connor’s uncle, will nto be happy that Connor borrowed an SUV to help Elisa and Theo getting it damaged by arrows in the process. Fallon and Jeff = Connor’s aunt and uncle who agree to take a vacation and lead the pack to Alaska allowing Connor to honor responsibility to the pack and to Chicago.